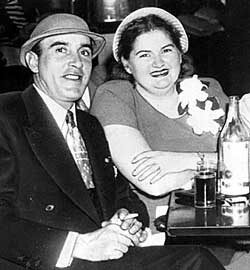 On this date in 1951, the made-for-tabloids killer couple Raymond Fernandez and Martha Beck were electrocuted at New York’s Sing Sing prison for murder. He was a toupeed middle-aged lothario with a knack for conning personal ad denizens. She was a lovelorn obese single mother* with a serious dark side. Together — through a chance meeting through the personals — they became the Lonely Hearts Killers. Martha Beck started off as just another of Raymond Fernandez’s targets: charm them, promise engagement or undergo a faux-wedding, and then rob them. He’d pulled this off a few times before; he might have even killed at least one of them. But something clicked when he met Martha. Or rather, Martha made it click. Fernandez did the love ’em and leave ’em routine with Martha, whom he soon realized was penniless. But their passionate hotel rendezvous had been spied by the local bluenoses, who promptly got Martha fired for her indiscretions. She showed up unannounced at Fernandez’s door, and pushed her way right into his life. Ere long, they were cohabiting — lurid media accounts would later savor their “abnormal sexual practices” and their, er, lifestyle relationship. She caused near-riots among the crush of spectators at their circus trial when she got into specifics of freaky stuff like voodoo fetish play. “A request from Mr. Fernandez to me is a command,” Martha testified. Since this was so — though the power dynamic between them really seems to have run in the other direction — she willingly joined in Mr. Fernandez’s scam, posing as his “sister” when he went to meet and charm his next mark. Once such assets as could be had were signed over, the pigeon was disposed of: often, they’d just make the “honeymoon” so unbearable that the target got the picture and left, so humiliated she wouldn’t dare come forward with the story. And sometimes — nobody seems to know exactly how many times — Raymond and Martha killed together. The Lonely Hearts Killers’ crime spree is thoroughly covered elsewhere. It carried them to Michigan, a non-death penalty state where they were arrested. There, they confessed in a ploy to draw a local sentence and avoid execution. Michigan instead extradited them to New York to stand trial in a sweltering courtroom and on every Gotham newspaper’s daily headlines for the murder of a Long Island widow. That confession given in Michigan helped seal their fate in New York. Though separated from one another on death row (but they kept up the treacly correspondence), Martha and Raymond were joined in death. On International Women’s Day of 1951, both were executed in New York’s electric chair, along with two unconnected, run-of-the-mill murderers. My story is a love story. But only those tortured by love can know what I mean … in the history of the world, how many crimes have been attributed to love? Given the newspaper ink spilled over these two, it’s no surprise that they’ve inspired plenty of subsequent writers and directors. The Honeymoon Killers (review) is a creepy 1970 classic, with a couple of latter-day imitators. * She abandoned her two kids to the Salvation Army when she hitched her wagon to Fernandez.